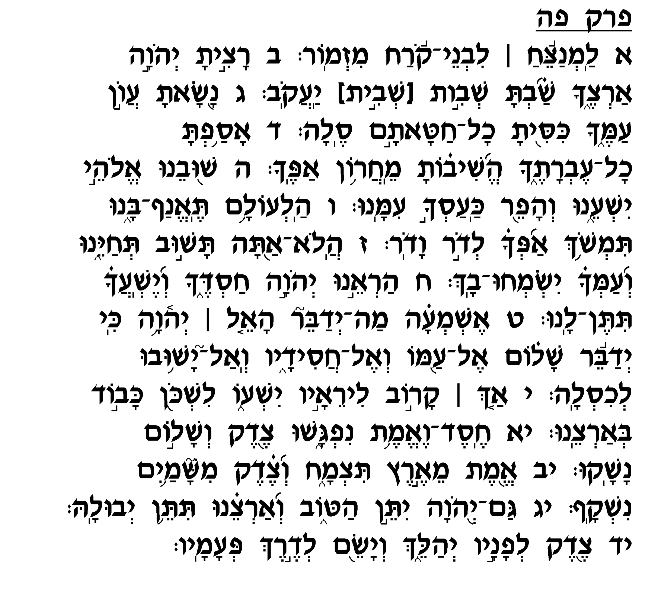 Like many other chapters of Tehillim, this Psalm was composed as a heartfelt prayer for redemption to be recited during the long exile. This prayer begins by reminiscing about the time when God forgave Am Yisrael and returned them to their land (verses 2-4). A number of commentators explain that in these verses the Psalmist reflects upon the period of the <?xml:namespace prefix = st1 ns = "urn:schemas-microsoft-com:office:smarttags" />Second Commonwealth, when God enabled the Jews to return from the Babylonian exile and rebuild the Mikdash in Jerusalem. This temporary redemption is looked upon as a critical precedent of the prospect of return from the Diaspora, of God's willingness to accept our repentance and return us from faraway countries to our homeland. After offering his plea to God to withdraw His anger and bring the redemption, the Psalmist proceeds to depict the glorious state of the world in the Messianic era. He speaks of a world where "kindness and truth meet" and "righteousness and peace kiss" (verse 11). This is a world without evil and corruption, where loving kindness, peace and honesty prevail. So much so, in fact, that "truth shall grow from the ground, and righteousness surfaces from the skies" (verse 12). It will seem as though honesty and justness abound naturally from the heavens and earth, as though the natural order itself breeds kindness and brotherhood. Whereas today the forces of good must continuously struggle against the forces of evil, and peace and kindness are, unfortunately, overshadowed by strife, greed and hostility, in the Messianic age peace and kindness will be an integral part of the world order, and will emerge as naturally as the sun rises in the sky and plants grow from the earth. In response, as we read in verses 13-14, God will bless the earth with rainfall and agricultural prosperity. When mankind lives in a manner that makes it appear as though kindness and peace emerge naturally from the heavens and earth, God responds in kind by ordering the forces of nature to bring blessing and success upon the world. Once we do our share in fostering integrity and brotherly love, God does His share in bestowing prosperity upon the earth.